First Line: The books were burning. Bethany Friend's mother is dying, and Detective Chief Inspector Hannah Scarlett is determined to reopen the seven-year-old cold case to find justice for the woman whose life was shattered by her daughter's death in the Serpent Pool. The case would be much easier for Scarlett to take on if she didn't already have several problems on her plate. She's been saddled with a sergeant who is known for causing trouble; she and her partner Marc Amos are still adjusting to their new home which is close to the Serpent Pool; and Marc's financial woes have made him susceptible to the charms of his pretty shop assistant. Then Hannah meets Louise Kind, the sister of the man she's been avoiding-- historian Daniel Kind who's helped her on other investigations. Daniel is back in England's Lake District working on a book about brilliant, opium-addicted Thomas De Quincey, and his sister Louise is living with wealthy book collector and lawyer Stuart Wagg. The stage is now set for an investigation filled with secrets and obsessions which mirror De Quincey's drug-laced writings for, you see, all these elements are related. 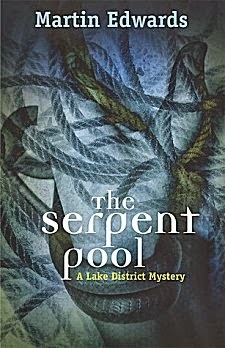 All you have to do is read The Serpent Pool and piece them together for a very satisfying-- and chill-inducing-- conclusion. I love how author Martin Edwards can weave together (1) a nuanced and compelling romantic triangle between Hannah, Daniel and Marc, (2) the glorious and sometimes creepy setting of England's Lake District, and (3) investigations into a fascinating cold case as well as one occurring in the present day. Every book in this series is consistently first-rate. The sky was bruised. Livid patches of yellow, with deep purple streaks. Hannah stood on the back door step outside Undercrag, staring up to the heavens as Marc strode off. The colours reminded her of the cheeks of a victim of domestic violence. It only stands to reason that a seasoned police officer would see a sky like that and compare it to domestic violence, but even though it's indicative of so many facets of Hannah's character, it's the type of comparison few writers use. And as for characterizations, the Lake District should be listed in a cast list. It is an area rich in history and literature and atmosphere, and Edwards knows how to use it to create stories in which readers love to immerse themselves. Wonderful characters, perfect setting-- and from its very heart-stopping beginning all the way to its shocking end-- an investigation that fascinates with every twist and turn. Although I had my beady eye focused in the right spots, I couldn't even begin to piece the conclusion together properly. If you've never read one of Martin Edwards' Lake District mysteries, I urge you to do so. They're among the best to be found anywhere. Cathy - Oh, I just love this series!! You're absolutely right that Edwards does a fantastic job of creating a compelling and very real setting. And I do like his Hannah Scarlett and Daniel Kind characters. Terrific mysteries, too, and this one is really creepy. So glad you liked it. I have yet to read a novel by Martin Edwards that I did not enjoy. He's a marvelous craftsman.